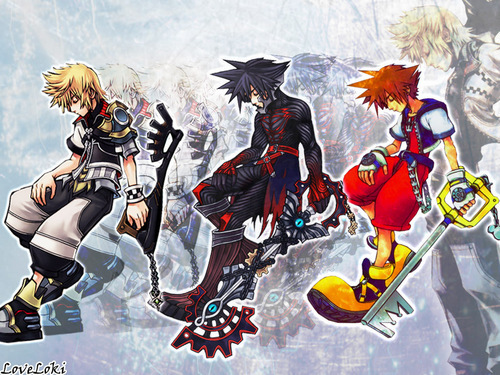 Ventus Vanitas Sora Roxas. Three station pictures, and a smexy Roxas in the background.. HD Wallpaper and background images in the किंग्डम हार्ट्स club tagged: kingdom hearts sora icon kh2 riku kingdom kh roxas ventus vantias. This किंग्डम हार्ट्स wallpaper might contain मोबाइल फोनों के लिए, हास्य पुस्तक, मंगा, कार्टून, एनीमे, कॉमिक बुक, and manga. I am absoulutely thrilled that you like it, let me join in the fangirlness. sora with a dark riku touch awzome! @Twengl02...uhm, no. Vanitas is NOT Sora or Riku-like. Not even close. Vanitas isn't Riku like. It wouldn't make sense. I mean Vanitas is like always dark but Riku doesn't want darkness but he uses it anyway. He does look a little like Sora though. Anyway i love the pic! I am nothing like Riku. Don't insult me by comparing me to a halfling. I am fully Dark, got it? And don't even go near that Light-hearted moron, he couldn't beat me even if he is like Ventus. My Keyblade looks too short. Dude! Long time no see, and thanks. I know I am! >:3 MWAHAHAAA! 22, 000 views...go to LoveLoki's profile! Look at it there too! They have some good KH stuff! i like the 1ste one most HOT!!!!!!!!!!!!! !